Be it the renowned Miami Beach or the legendary Walt Disney World in Orlando, Florida has long been celebrated as one of the ideal holiday destinations that promises a fun and enjoyable time for tourists and vacationers from all across the world. But did you know that there are various other lesser-known but equally (if not more) promising tourist attractions that are scattered all across the Sunshine State? All you need is some fuel in the tank and some info on the whereabouts of these spots and rest assured, you are in for a ride. Here’s one of the most precious hidden gems in Florida and the top reasons why it must be the next destination on your travel list. When visiting Florida, you will be just a bridge away from one of the most beautiful places on this earth. Merely a 20 minutes drive away from Bradenton, awaits the serene and peaceful life at Anna Maria Island, Florida. Sightseeing the piers buzzing with fishing and similar activities, devouring the best seafood cuisine, shopping in historic stores or simply relaxing at the pristine beaches are just a few examples of the numerous things that you can do when you visit Anna Maria Island in, Florida. Before we explore more about what this paradise-like island has to offer, let’s take a look into the brief history of this place. Stretching almost 7 miles in length and about 2 miles across, this family-friendly island is a barrier island onin Manatee County near Florida’s southwest coast. Sometimes also called Anna Maria Key, the Anna Maria Island, is surrounded by the Gulf of Mexico on the west, the Longboat Pass on the south, Tampa Bay to the north and Anna Maria Sound on the east. The Anna Maria Island was first discovered by Native American tribes in the early 1500s, but the first settlement didn’t begin until the start of the 20th Century. Although the initial attempt to connect the isolated beach with the mainland was unsuccessful as a storm wiped out the half-completed bridge in 1921, Anna Maria Island soon gained popularity in business circles. Today it is a famous location in Florida, but despite catering to a large number of tourists, the place still maintains a sense of utmost peace and serenity. And it is this very tranquility coupled with its exotic wildlife and natural beauty that attracts people of all age groups from all over the world to unwind and have fun. This low-lying strip of land is further divided into three main areas. This includes the Bradenton Beach to its south and Anna Maria city on the north end whereas Holmes Beach is situated in between these two regions. The island has a total population of about 8,500 people that is largely divided between Anna Maria and Holmes Beach. If you are a beach lover, then Holmes Beach is the place to go whereas if you are a food enthusiast, then the northern end of the island should be your first stop. Here are the top things to do when you visit Anna Maria Island, Florida. 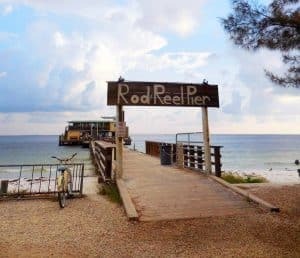 Delve into the best seafood you can ever find by visiting Rod & Reel Pier – the pioneer of local seafood that has been thriving since its inception in 1947. Located at the farthest northern end of the Anna Maria Island, this fresh food diner has become the official staple of the island. While crossing the long boardwalk to the restaurant at the end of the pier, you will come across several local fishermen busy catching fish for their guests. Stop by for a chat, and they might let you have a go as well. Or if you cannot resist the hunger as the aroma drifting from the restaurant tantalizes your taste buds, then simply head to the restaurant directly and order from a variety of seafood dishes that range from local favorites to chef’s special. Pine Avenue is a unique place to shop for various items when you visit Anna Maria Island. Instead of high-end shopping malls, you will see countless traditional boutiques lining the streets. Search the market for what you want and grab some gifts for your loved ones. The local hand-made jewelry is the best souvenir that you can takefind for your friends and family. If you are low on a budget or not in the mood for shopping, then just grab your favorite ice cream cone and tour the historic avenue that ultimately leads to the iconic City Pier that is over a century old! Bridge Street, located in the Bradenton Beach region is a place where time seems to stand still. With old-style shops and street-side restaurants situated exactly opposite the pure white beaches and translucent green gulf waters, the place is a subtle nod to the old world charm. Dive into the refreshing temperate water or soak in the surrounding beauty while you relax and rejuvenate under the sun. Bridge Street is the ideal place to revitalize your mind and revive your energy by getting rid of all the stress and disposing of your worries as you witness a laid-back lifestyle onin one of the most ethereal places in Florida. Did reading about this hidden gem in Florida ignite your wanderlust? You may not have heard of Anna Maria Island, but it’s a great spot to enjoy the beach, shopping and dining that south Florida has to offer. Anna Maria Island also offers some of the best vacation rentals near the Gulf of Mexico. To find out more about the beach vacation rentals available, contact Jennette Properties today!